PROVIDENCE LIMO BUS // BEAUTIFUL & AFFORDABLE LIMO BUSES IN PROVIDENCE! Welcome to Providence Limo Bus! We are proud to be the number one limo bus company! We are a company specializing in luxury transportation, and we're available for any event 24/7 all over Rhode Island! We built our company around the bold idea that luxury should be affordable and accessible to all who are in need of it. That's why we offer affordable rates and convenient twenty four seven service all over the city and surrounding communities in the state. We are committed to our clients and we want you to have the best experience possible, you deserve to enjoy an unforgettable evening! We work hard for you and we hope to have many more years of bringing the best luxury limo buses and services to locals and tourists. In a beautiful city like Providence there's always something going on whether it's something you planned on your own our a local festival or celebration. We've had a great time taking clients out to celebrations like Eat Drink RI, WaterFire, PrideFest, Independence Day parties, and even events like the Rhode Island Comic Con. Your imagination is our limitation, and the sky is the limit for that. Take your night out to the next level and spend the evening like a VIP, arriving at your destinations in a beautiful limo bus! Getting married? Celebrate your big day to the fullest and travel in one of the most beautiful limo buses in the state! If you've never had to reserve transportation before, you're probably a bit unsure on where to begin. We invite you to browse our site to learn more about us, view our varied fleet of vehicles, and read more about our event services and where we are able to service! The great thing about booking with a company like us is the fact that our area of service is something that is always growing. After all, there is a lot to explore, so why just limit it to one city? Just give us call us when you're ready to get a quote, book your reservation, or if you have any questions about the process. We're here 24/7 and we'd love to help you whenever you have a couple extra minutes to talk! Each of our vehicle selections is completely spacious and full of amazing features like tinted windows for privacy! 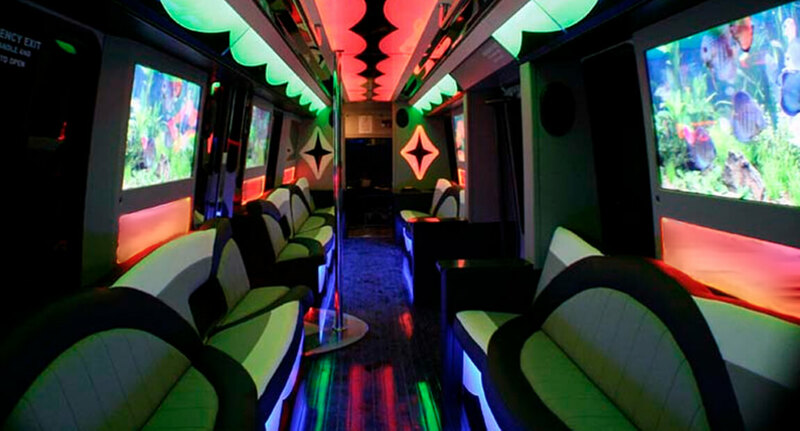 This bus is perfect for any event, so give us a call for more information on how to reserve today. When you step on board our vehicles, you'll get to enjoy things like custom leather seats and exotic wood floors. There is even a stage on our largest vehicle for those who might be looking for entertainment! Flat screen television screen panels, dance pole, and counter top bar areas complete with cup holders for your beverages are all included with our price. We bet you wont be able to find a comparable service. 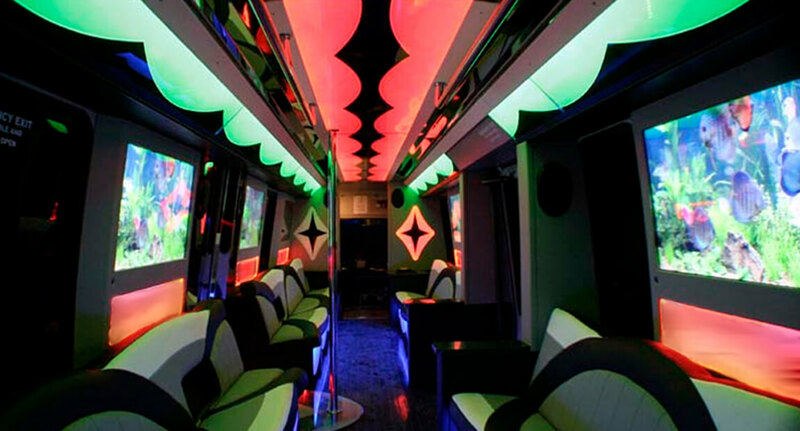 The beautiful accent lights make this bus like a night club on wheels! Teenagers love the neon lighting that surrounds them, and so do adults. It's just one of the ways we provide an excellent atmosphere. 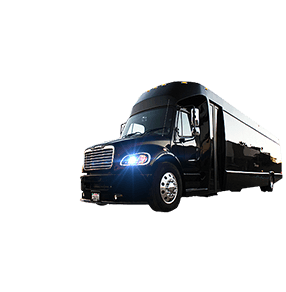 One of the most popular ways to take advantage of our transportation services is to take a vehicle out on a bar hopping adventure or night out with your closest friends. 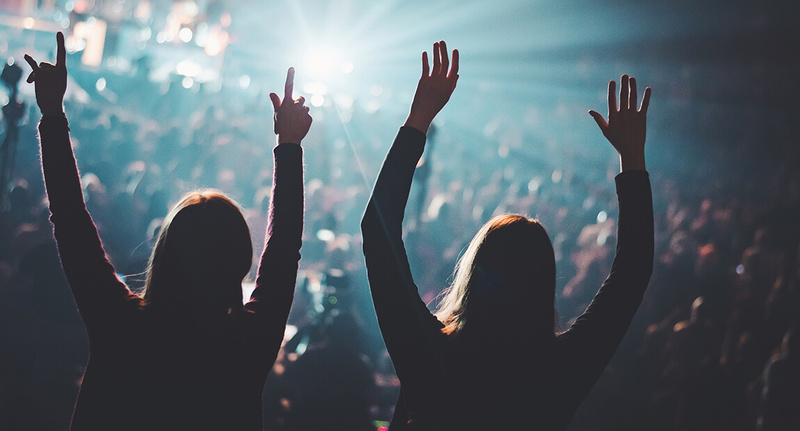 These are some of our favorite events because there are so many fun destinations to choose from, and we'll be happy to help you choose an itinerary if you're having trouble picking out some places to check out. We've had a lot of success taking clients to places like the Malted Barley, Grad Center Bar, the Avery, Justine's, and more! There are so many great local businesses to support with your patronage, so you'll never run out of options to choose from. The best thing about reserving transportation for this type of get together is that there is no need to find a designated driver when you've rented a block of time with one of our professional chauffeurs. Everybody will get home safe and sound. It's a great experience from start to finish. Many locals choose to use popular rideshare services for events and get togethers, but trust us when we say that they'll never be able to compare to our modern experience of luxury and spacious cabins for standing and socializing with friends and family. 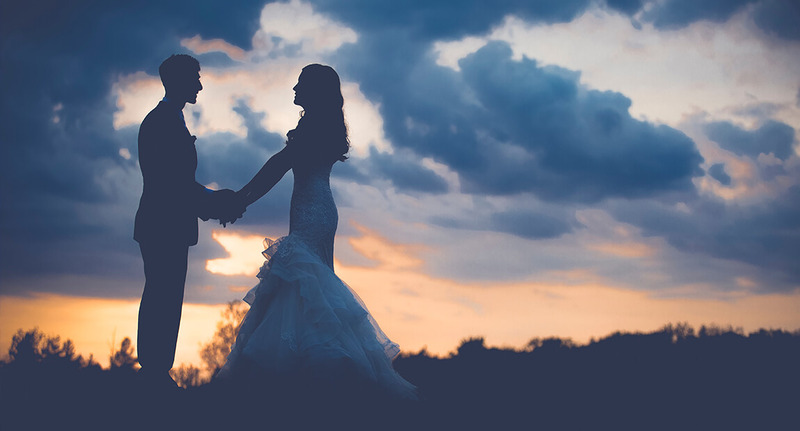 Although we're known for being great company at wild parties like bachelor and bachelorette parties and night club hopping, we're also a top choice for major life milestones such as weddings. Trust that we will be able to provide a polished vehicle on time for these events, just as we've done for countless other newlyweds in the area who have been completely satisfied with our transportation. With years of experience at weddings at local venues like Omni Providence, Roger Williams and the Imperial Room, we'll certainly be able to adhere to your specific itinerary and venue. For our superior service, vehicles, and prices! We continously strive to bring the best service to you at the best rates. We keep our amazing buses in great shape and packed with the state-of-the-art features so that there's never a dull moment on the roads with us! We go above and beyond for our clients and our services are available 24/7 all over Rhode Island! We also work hard all year to keep our prices competitive and low. Our company is committed to you from start to finish! to enjoy your event to the fullest extent! © 2017 | www.ProvidenceLimoBus.com | All Rights Reserved.